Windset Farms® is pleased to partner with Newmans Fine Foods, of Delta, British Columbia, for its BC Day BBQ Giveaway! There’s no better way to enjoy BC Day long weekend than BBQing with friends and family. 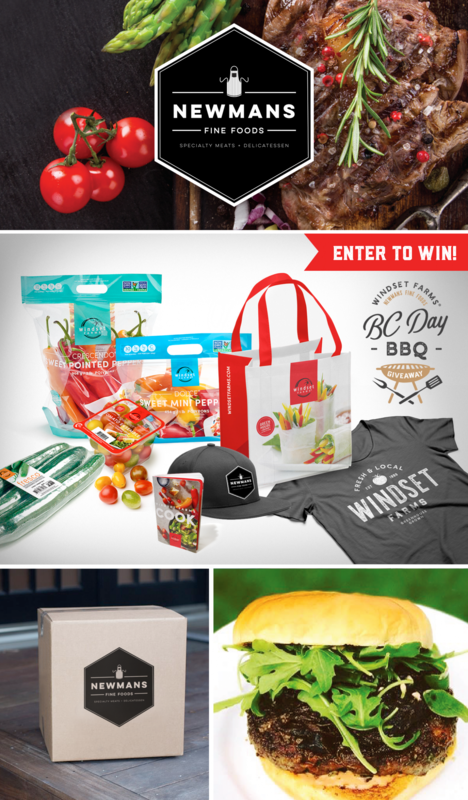 Windset and Newmans wants to give one lucky winner an assorted prize pack filled with fresh, greenhouse grown produce and locally sourced and sustainable meats to get your BBQ party in full swing! The giveaway will run from July 24th to July 30th and is open to residents of British Columbia, Canada only. The winner will be announced July 30th, just in time to receive their prize pack for the long weekend! To enter the contest please visit our Instagram and Facebook pages. For more information on Newmans Fine Foods, please head over to their website at www.newmansfinefoods.com. Please see below for official contest rules. The following contest is open for residents of the province of British Columbia only, and will be construed according to the laws and regulations of the province of British Columbia. While Windset Farms® 3660 41B Street, Delta, BC V4K 3N2 and Newmans Fine Foods #105 – 5188 Springs Boulevard Delta, BC V4M 0A6 welcome submissions to its database from international readers and readers outside the province of British Columbia, only BC residents will be eligible for contest entry. This contest is void where prohibited or restricted by law. This contest is in no way sponsored, endorsed or administered by, or associated with, Facebook or Instagram. Entrants are providing information to the Sponsor and not to Facebook or Instagram. We will not sell your information (name, contact information, or email address to any third parties). NO PURCHASE OR PAYMENT NECESSARY TO ENTER OR WIN. ENTRANTS MUST HAVE REACHED THE AGE OF MAJORITY. One (1) case of assorted produce from Windset Farms® that may include: Fresco® Long English Cucumbers, Concerto® Grape Tomatoes, Concerto® Gold Grape Tomatoes, Campari® Tomatoes, Roma Tomatoes, Symphony® Tomato Ensemble, Delicato® Living Butter Lettuce, Virtuoso® Beefsteak Tomatoes, Maestro® Sweet Bell Peppers, Crescendo® Sweet Pointed Peppers, Dolce® Mini Pointed Peppers, Adagio® Eggplants. Value of the prize is approximately $225 CND. To participate, “follow” Windset Farms® and Newmans Fine Foods on Instagram and/or “like” both pages on Facebook. “Like” the contest announcement picture on Facebook OR Instagram, comment your favorite BC Day Long Weekend tradition or plans for the upcoming holiday, and tag 3 friends. Submissions may be shared on @WindsetFarms social media channels on Instagram, Facebook and Twitter. Winner will be announced on Facebook, Instagram and Twitter. Participation in this contest constitutes the contestant’s full and unconditional agreement to and acceptance of these Official Contest Rules. Participants who do not comply with these rules are subject to disqualification. The Contest Sponsor reserves the right to reject entries which contain submissions which it determines in its discretion to be offensive, obscene, or indecent. To be eligible for the contest, entrants must be legal BC residents, who have reached the age of majority in their province of residence at the time of entry. Employees of Contest Sponsor, its affiliates, marketing partners, suppliers, advertising or promotional agencies, prize suppliers, and the immediate family members (mother, father, brother, sister, son, daughter, spouse) of, or persons residing in the same household as any of the foregoing persons, are not eligible for the contest. All federal, provincial, and local laws and regulations apply. One (1) random winner will be selected based on entries from July 24th, 2018 through July 30th, 2018, unless otherwise indicated. Odds of winning are dependent upon the total number of eligible entries received. The Contest Sponsor or its representative will attempt to contact the selected entrants through social media entry method, telephone, or e-mail once per day for two (2) business days. If a selected entrant cannot be contacted after two (2) business days, or is contacted but deemed to be ineligible in the Contest Sponsor’s sole discretion, or is unable or unwilling to comply with these rules, that selected entrant will be disqualified and another entry will be drawn. This process may be repeated until an entrant has been declared the winner. Prizes must be accepted as awarded with no substitutions, whether in cash or otherwise, except at the Contest Sponsor’s sole discretion. The Contest Sponsor reserves the right to substitute a prize of equivalent or greater value if a prize cannot be awarded as described for any reason. Prizes will only be awarded to verified winners. All decisions of the Contest Sponsor or their authorized representatives are final and binding in all matters relating to this contest. The contest and the rights and obligations of the entrants will be governed and controlled by the laws of the province of BC, and the federal laws of the country of Canada applicable therein, and any disputes shall be referred to the exclusive jurisdiction of the province of BC, Canada.